If you think that the Great Smoky Mountains straddling the border between North Carolina and Tennessee will be a fun time for the family, then plan on several days in Pigeon Forge, several days in Gatlinburg and take a day to go to Cherokee, North Carolina and Maggie Valley. Your family will love Gatlinburg and Pigeon Forge. If you have never visited the area, there’s a lot to see and do. Dollywood and Dixie Stampede will keep children and teens thrilled in Pigeon Forge while the shopping in Sevierville and Pigeon Forge will thrill mom while dad finds the golf courses to excite his golfing ambitions! There’s something for the entire family in the Great Smoky Mountains of Tennessee. 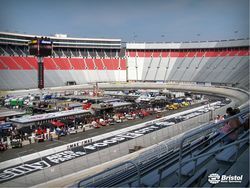 You’ll want to wear good walking shoes when you visit the “World’s Fastest Half Mile” Bristol Motor Speedway for a NASCAR race. Hiking boots are even better because of the steep inclines. Remember that Bristol is in the heart of the mountains. Take a scenic drive and enjoy the natural surroundings! Fans who have wondered what it would be like to cruise around the World’s Fastest Half-Mile in a race car can get the chance to do just that as part of the Richard Petty Driving Experience Ride-Along program. Tennessee played a critical role in the development of many forms of American popular music, including rock and roll, blues, country, and rockabilly. Beale Street in Memphis is considered by many to be the birthplace of the blues, with musicians such as W.C. Handy performing in its clubs as early as 1909. Memphis was also home to Sun Records, where musicians such as Elvis Presley, Johnny Cash, Carl Perkins, Jerry Lee Lewis, Roy Orbison, and Charlie Rich began their recording careers, and where rock and roll took shape in the 1950s. The 1927 Victor recording sessions in Bristol generally mark the beginning of the country music genre and the rise of the Grand Ole Opry in the 1930s helped make Nashville the center of the country music recording industry. Three museums recognize Tennessee’s role in nurturing various forms of popular music: the Memphis Rock N’ Soul Museum, the Country Music Hall of Fame and Museum in Nashville, and the International Rock-A-Billy Museum in Jackson. 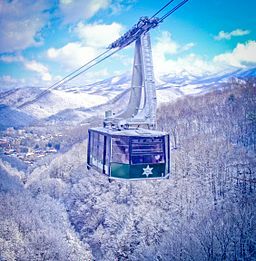 Located near Gatlinburg, Tennessee, Ober Gatlinburg is the only ski resort in the state. It is more than just a ski resort, however. It is a complete family vacation spot with an amusement park, indoor ice skating, a bungee tower, an alpine slide, and many other activities and attractions – there is something to please everyone. Rentals are available for both ski equipment and snowboarding equipment. Private and group lessons for skiing and snowboarding are also available through the Smokey Mountain Snow Sport School. You can also easily find food at the many snack bars, food carts, the café, the restaurant, or in the lounge. You must not miss the longest chair lift ride in the south! You will see awesome views of the Great Smoky Mountains. You will also get a bird’s eye view of some of the slopes, and you can have your picture taken on top of the mountain. If you don’t ski, don’t worry! You can ride back down the mountain on the chair lift as well. Don’t forget the Tramway. The tramway departs from downtown Gatlinburg and takes you to the ski resort and the amusement park. Even if you don’t ski, you can still explore the thrill of flying down a mountain at a high speed – or a slow speed if you choose. This is possible with the Alpine Slide. The slide is approximately 1800 feet long, and takes you down a winding wooded slope. You have total control over your speed with the use of a braking device on each sled. Other attractions at the amusement park include the Black Bear Habitat, a bungee jump, a water race, go karts, indoor ice skating, kiddie land, an arcade, miniature golf, a Spider Web Velcro Wall Jump, water rides, and a shooting range. No matter what type of fun or adventure you are seeking, there is something to satisfy everyone in the family at Ober Gatlinburg Ski Resort and Amusement Park. This is definitely a trip worth taking – especially if you have younger kids or senior citizens traveling with you.